Rolling off the back of an absolutely cracking sub-£300 PS4 Pro bundle deal over at Amazon, now Currys PC World has got in on the Black Friday action with its own epic deal, which delivers a whopping £172.96 saving. For £339.99 you can for a limited time pick up a Sony PlayStation 4 Pro 1TB console along with FIFA 18, Crash Bandicoot N. Sane Trilogy, Doom, Fallout 4 and Call of Duty: WWII. That's Sony's flagship 4K, HDR console alongside some of the most well-received games of the past couple of years. Check out the deal in full below. Holy moly this is one hell of a bundle deal. 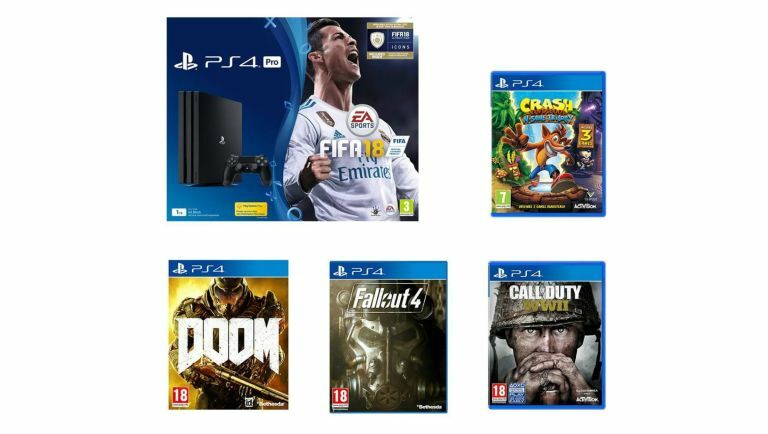 For just £339.99, which is a pre-deal saving of £172.96, you get a PS4 Pro 1TB along with FIFA 18, Crash Bandicoot Trilogy, Call of Duty: WWII, Doom and Fallout 4. That is a 4K, HDR pixel-pushing powerhouse with some of the best games currently on the market. View deal now over at Currys PC World. This is, in terms of bang for you buck, the best PlayStation 4 Pro deal we've seen this Black Friday sales season. While £339.99 certainly isn't cheap, when you consider the wide selection of top titles you get for the money, and the fact that Microsoft's own flagship Xbox One X console is retailing on its own for £449.99 right now, it definitely offers mad value for money if you are looking to game at 4K.